A dark teenage drama, this one is interesting from a character perspective even when the story isn’t anything out of the ordinary. This is a very interesting film about a highschool boy who does not have things together. Sutter (Miles Teller) used to be the life of every party until his girlfriend dumped him. now he’s a mess. He’s got a drinking problem and is losing self-esteem points by the minute. then he meets Aimee, and everything changes. this is a movie that actually tells it like it is, including teenage drinking that is not played for laughs. The film tries to avoid cliche every step of the way, and that takes us into some pretty creative territory. it’s not a great film, and could have used a little more excitement at times, but boy is it entertaining. 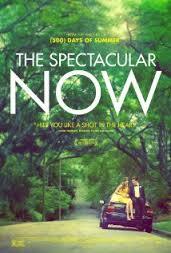 The Spectacular Now is a fascinating character study. It’s a pretty entertaining movie that gets by because of its characters more than it’s story. On the one hand, we’ve never seen a drama about a teenager who is an alcoholic and is also the coolest guy in the school. There have been comedies about teenagers drinking, like Superbad, but nothing where the drinking is such a problem. And then there’s the other hand, where this movie is about a romance and also about a kid whose father left him when he was young, and leaves him now searching for answers about his past. We’ve certainly seen storylines like that before. What makes the spectacular now so interesting is the combination of the character and the actor. Miles Teller, an actor who is just breaking out, and poised for something big, really gets the chance to shine in this movie and show what he’s got. Teller has only made goofy teenage comedies up until this point, with films like Project X and 21 and over. He did have the chance to show he was something special, with a small role in rabbit hole, and he absolutely nailed it. Here, in the spectacular now, he has the opportunity to carry a movie, and he definitely succeeds. The movie introduces us to Sutter (Teller) as he sits at his computer writing a college essay. The essay wants to know about what his biggest challenge has been so far and what he learned from it. We hear Sutter’s voice-over take us through the ideas in his head. This is a guy who really doesn’t have anything substantial to say in response to the question. instead, all sutter can talk about is how he and his girlfriend are always the life of every party. Sutter is only about a month or so away from his high school graduation, and he has a short term goal of getting his best friend a girl. It’s a little hard to believe that sutter would be so good with the ladies and his best friend so bad. Usually the popular kids with similar interests hang out together, but in this movie, his getting his friend some action serves a purpose. It causes Sutter to be in a car with another girl when his own girlfriend, cassidy (played by a terrific brie larson), shows up, thinks he is cheating on her, and breaks up with him. Sutter can’t believe it. All he was doing was sitting in a car with this girl, and he certainly had no plans of cheating. Only cassidy doesn’t believe him and is serious about the break up. Maybe she was at the point where she was ready to break up with him anyway, and this cheating business just gave her an easy way to do it. Sutter goes out partying hard after he is dumped and finds himself waking up on a neighbor’s lawn the next morning, having no idea where his car is parked. this is where sutter meets aimee (played by shailene woodley.) she’s a smart, innocent girl and the exact opposite of anyone sutter would ever consider dating. only he kind of likes her. she’s nice to him and drives him around, looking for his car, and sutter finds her fascinating. he can’t believe she delivers newspapers for her mom, driving them around and throwing them on neighbor’s lawns like people used to do it in the old days. sutter invites aimee to a party, hoping to use the opportunity of bringing a girl to make cassidy jealous and win her back. it doesn’t work. cassidy has already moved on to another guy. and when sutter sees aimee talking to other guys as well, he starts to feel the jealousy that he hoped to create in cassidy. what an ironic scene. he can’t let this girl slip away too. sutter moves in and swoops aimee away from those other dudes, taking her into the woods for a romantic walk. he ends up asking her to go with him to prom. the main story here is between sutter and aimee, and their unlikely relationship, but there’s another one that pops up as well. it’s the story of sutter and his father. sutter has not seen his father since he was young. he lives at home with his mom, played by jennifer jason leigh, and is under the impression that his father was cheating on his mom and so his mom kicked the man out. sutter blames his mom for all of this and believes that she is trying to keep him from seeing or speaking with his dad. aimee encourages him to keep trying. the father story becomes a nice middle section of the film. sutter goes to see the man (played by kyle chandler, who, like teller, is also on the rise as an actor), and he learns pretty quickly that his father is a jerk. i like that nothing major happens here. you keep expecting something terrible to happen with the father, or even with sutter. maybe some kind of major drunk driving incident. only it never does. even when a character does get hurt, it’s very minor. that’s this movie trying to keep things realistic and away from the usual cliches. it works. there’s a great scene where the boy cassidy is dating confronts sutter in a clothing store, and what ends up happening is so far away from how it would normally play out in any other movie. instead of being a jerk and the antagonist to sutter, and maybe even threatening him, this kid actually asks for sutter’s help. the spectacular now is like a modern day good will hunting. It’s not as heavy, and not about a guy meeting with a psychiatrist or having suffered from physical abuse, but it’s certainly about a guy who is broken and has had to deal with the consequences of having a lousy father. sutter works at a suit store for a boss (played by bob odenkirk), who tries to give him advice. only sutter isn’t having any of it. he doesn’t really change, regarding his drinking, during the course of the film, and that’s another way that this movie avoids the corny cliche’s that other films would have eaten up with a silver spoon. this movie wants to be something more, and while it could have used a little more excitement, it definitely held our interest and attention.